Recently, I heard that there is research coming out about the development of a series of vaccines to treat Celiac. I signed up for updates and information - and to maybe take part in a trial - through Beyond Celiac. Now, I get interesting updates in my email every week. Apparently May is Celiac Awareness Month. Who knew? Actually, it's ironic that I didn't know because I was just about to write, "I've lived with Celiac in my family my entire life and I've lived with it personally for 20 years, so there's not much I don't know." 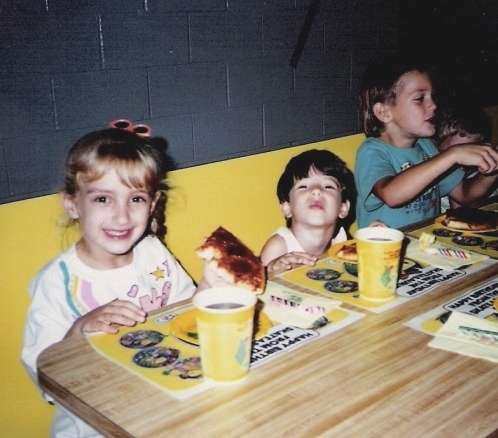 Eating pizza like a normal kid back before I was diagnosed. 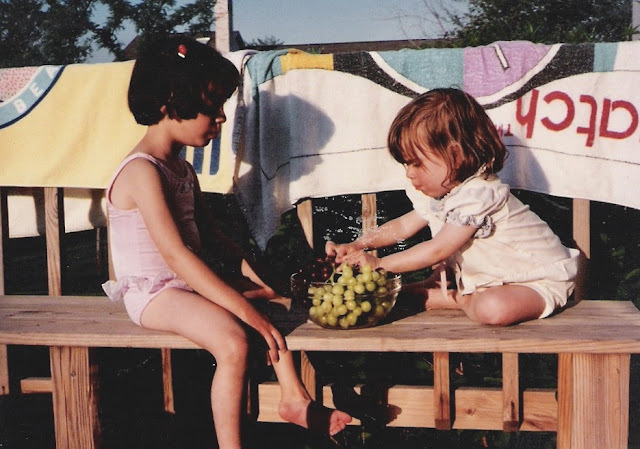 My sister was diagnosed when she was 18 months old. This was back in the early '90s when Celiac was pretty unheard of. About eight years later, research came out about the heredity of the disease, and our entire family got tested. Snacking on some naturally gluten free goodness! My blood test came back positive (no surprise - I was really underweight and had stomachaches all the time) and we confirmed it with an endoscopy. But this post is not about my diagnosis story or how I adjusted or any of that. I wanted to talk about how I relate to these "I wish people knew" stories. Even though I've had Celiac my entire adult life, I can see how I have to live differently than others in ways people often take for granted. 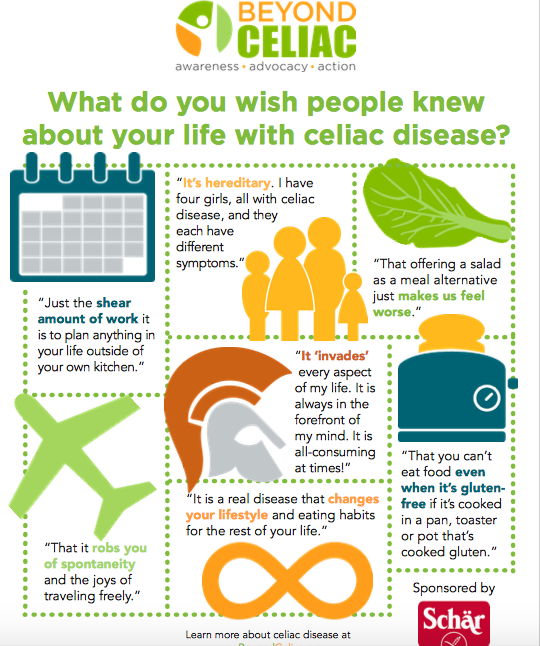 The truth is, I don't consciously often think about my life with Celiac, even though I think about Celiac almost daily. If we're going to try a new restaurant, I look up the menu online to see if I can eat anything there. I avoid certain types of food - like Chinese takeout - entirely. I eat before events - like friends' weddings or the Triumph event I was invited to speak at in March - because I never know if I'll be able to have what's served. Delicious-looking flan-style mousse at the Triumph event...safe to eat, or nah? I am not shy about asking if I'll be able to eat what's on the menu, but I do feel badly asking for something special to be made, so I just pack a snack. My purse is always full of snacks for that reason! I never feel like I can be spontaneous and go to a non-English speaking country because I'm too afraid I'll end up eating food I can't have. When I chose to study abroad in college, there were two main factors in my country of choice: can I speak the language and therefore eat safely, and were people I knew going. 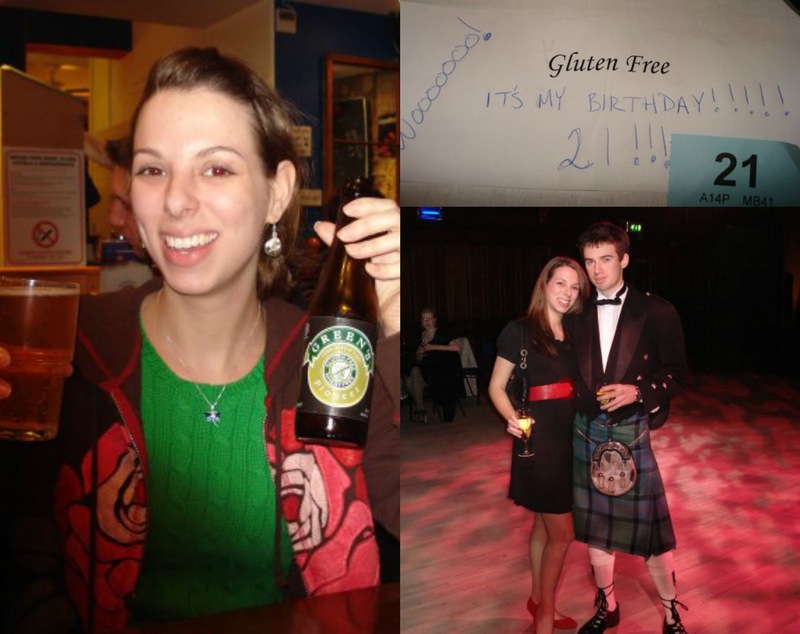 Scotland was the right choice because they had gluten free options all over the place...and kilts! I am not "healthier" for eating gluten free in the sense that I absolutely love junk food and sugar. I'd prefer to eat like a 5-year-old at a birthday party daily. The only reason I'm "healthier" for eating gluten free is that, for me, gluten is damaging. "Anchor down for Italian restaurants with over 15 gluten free options for my friends who are physically unable to consume gluten!!!" And of course, anytime I'm going to eat, it becomes a factor. 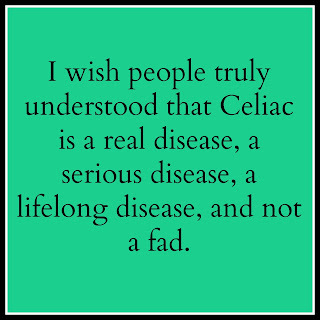 But I do not spend hours of my life thinking about Celiac and how it affects me. I hope the person who sent in that note is a new diagnosee and can find balance and peace, because their life sounds exhausting! These days I know lots of people who have Celiac, but growing up it was just me and my sister. It's kind of fun to be able to trade expertise with friends now...back in the day, tasting GF food was expensive and often disgusting. It's honestly amazing to me how many GF baking options we can find at the normal grocery store these days. My mom baked bread for Stephanie and me. We ordered food from Canada (Kinnikinnik was our first foray into gluten free donuts) and it was a big deal when a shipment arrived. 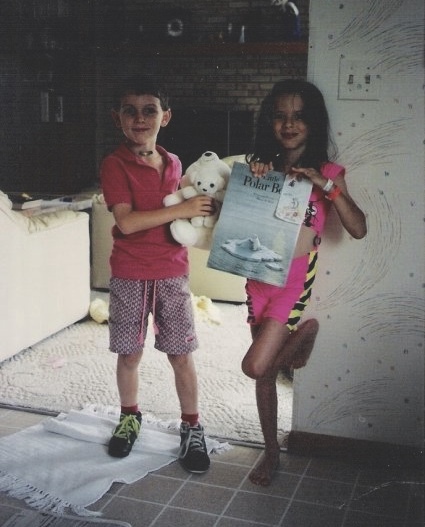 I remember looking at the catalogue and circling things with Steph as we decided what looked worth trying out. We're both in the habit of sending each other photos of new GF foods we find in the grocery store because the novelty hasn't worn off. Anyway, the best thing Celiac has done for me is make me an adventurous eater. If I can eat something, I will try it at least once. 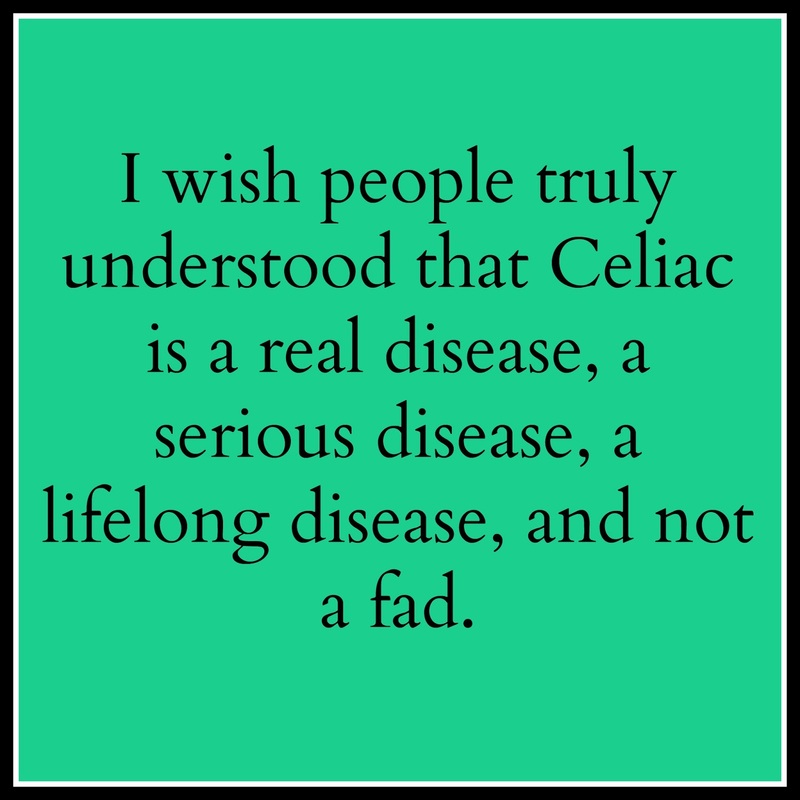 I am living a happy, full life with Celiac, and as far as autoimmune diseases go, Celiac isn't really that bad. It's not too hard to avoid gluten and thereby live a healthy life. I don't mean to be dismissive of it, though; adjusting to the diet can be tough and the symptoms can be awful and dangerous; I'm just at the point in my life where it's all second nature. 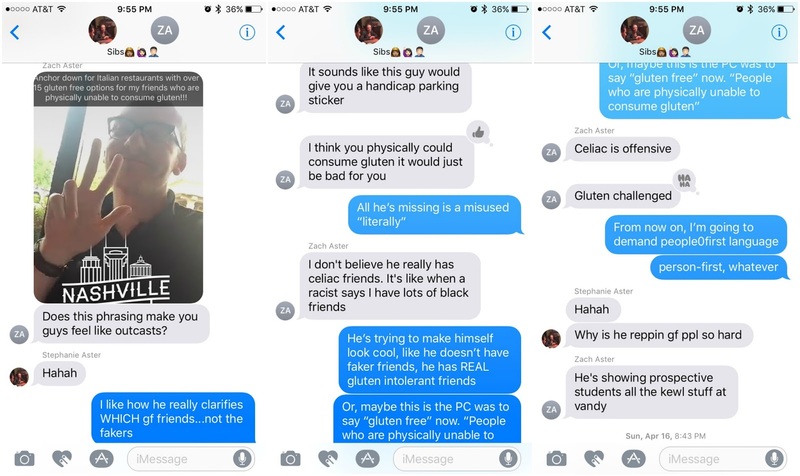 The gluten free fad has been a double-edged sword, and I just wish people were more aware that the condescension for people who eat gluten free can be harmful for those of us who need to be able to trust ingredient lists and labels when shopping and servers and chefs when we eat out. "That offering a salad as a meal alternative makes us feel worse." Literally, this! I would also add to the list that it's expensive, and somewhat annoying to have to grocery shop/cook separately from your significant other. I can see the gluten free fad being a double edged sword. On one hand, I bet you are so happy for there being WAY more options, and hopefully more affordable options at that. (Example: Aldi has a ton of gluten free food.) Then on the other hand, you have people doing the diet as a fad. I will admit, the people that are on the gluten free fad diet... it bugs me! I don't know why it bugs me. Someone's choice not to eat gluten doesn't affect me, so why do I care? I wish I weren't judgmental about that. About 11 years ago, I was doing the choreography for my district's HS musical and one of my dancers was eating a weird kind of bread. I was chatting with him and he explained that he couldn't eat gluten. At the time, I had no idea what gluten was and never ever heard of Celiac before. I remember feeling REALLY bad for him because he couldn't eat pizza! My dad has celiac and I am tested often (with one endoscopy so far). So far, nothing has shown up in the tests but if I eat too much gluten I get a rash on my stomach and back area, so I really just avoid it (and dairy). We have a motto about it and we say "don't focus on what you can't eat, focus on what you can eat"....and there is SO much. The hidden sources in sauces, etc are the most challenging but thankfully there are so many more options out now. Many of our restaurants in my town have gluten free menus which makes it so much easier! And because I love to bake, I have mastered both the chocolate chip cookie and quick breads! I just wish gluten free flours and xanthan gum were a bit less pricey. S Sharp, has that rash been checked by a dermatologist? Dermatitis herpetiformis occurs with the ingestion of gluten in some people, and a gluten-free diet is the treatment. That and dapsone, I read. Thank you. I have had it checked by a dermatologist and I was given a topical steroid cream. When I have my yearly check up w/ my internist we will run the blood test again to make sure. 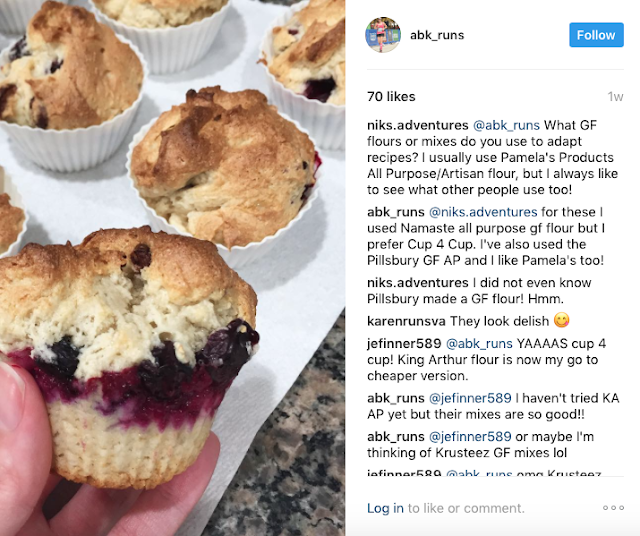 This is a great post explaining why you need to eat GF. It really puts into perspective that those of us that are not GF should not take it for granted. One of my roommate in college had celiac disease and all I knew about it back then was that she had her own pasta!